People now spend over 3 hours a day in their kitchen. Beyond cooking, baking and eating — kitchens are now being used to entertain, socialize and do work or homework. “Given all of this activity, it is not surprising that nearly two-thirds spend over three hours a day in their kitchen”, reported by Houzz. Which means you are now sitting on bar stools and chairs for a much longer period of time. They’re continuously being sat on, swiveled or moved. 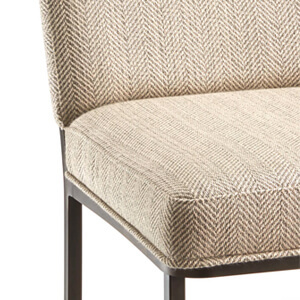 Because of this, you need seating that is going to last long and be made for daily use. Heavy-duty steel metal frames ensures your stools won’t wobble or break down over time. 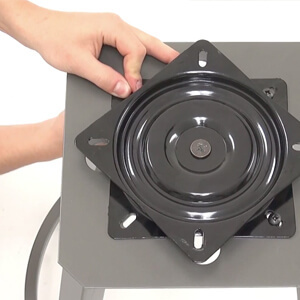 Extra strong swivel plates ensures your swivel stools continue to work as smoothly as the day you bought them. Best wearing fabrics, vinyl and leather in the industry ensures your seat or back cushions will stay true to color and wearability over a long period of time. Our bar stools are built for 10 … 15 … 20+ years of daily use. Change the seat or back cushion color by reupholstering it. Simply, unscrew the four bolts underneath the seat and the seat pad will come off. We recently reupholstered one of our kitchen stools. It was quick, easy, and made the stool look fresh. Or, you can simply purchase new seat or back pads from us, upholstered in the color of your choice. Make your base taller or shorter by buying a new base of a different height. It’s better than throwing away a beloved stool (and cheaper than buying the whole stool). Convert a swivel stool to a fixed-seat stool by installing a screw underneath the seat which will prevent the stool from swiveling. This works great for customers who have kids. When the kids get older, simply take the screw out and your stool is back to swiveling. 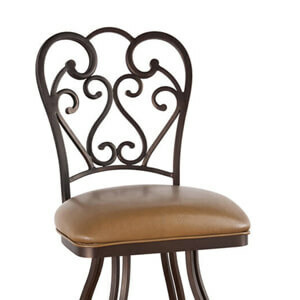 It’s no wonder why so many customers have chosen to invest in our bar stools: they’re saving hundreds of dollars! They did it because they’re smart. And you are, too.